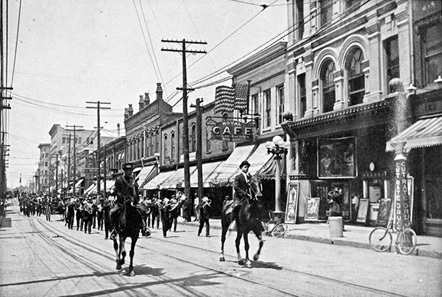 This parade on East Main Street provides a glimpse of some of the original buildings and businesses that lined the street, built primarily in the last decades of the 19th century. Durham’s tobacco and textiles industries grew rapidly in the late 1800s, leading to a construction boom. As industry moved in, demand for new commercial space followed, allowing for developments such as this one on Main Street. The purpose of the parade is not known, although the band is likely the Durham Hosiery Mill’s brass band. The Royal Cafe featured in this photograph was a popular eatery, which, as its sign proclaims, provided “quick service” “for ladies and gents.” Most of this block was torn down in the 1960s with urban renewal funds, drastically altering the streetscape.